The following is provided/used by the kind permission of Dave Brocklehurst, MBE and the Kent Battle of Britain Memorial Trust (and the Woolley family). This is the story of one Battle of Britain airmen, Sergeant Arthur W. Woolley of No.601 Squadron who was shot down seventy-seven years ago today, 11th July 1940. Luckily he baled out with only slight burns and some broken ribs, but he became one of the first RAF airmen during the Battle to be machine-gunned on his parachute, but luckily survived to tell the tale. On the evening of Thursday 11th July 1940, No.601 Squadron were ordered to take off from RAF Tangmere. F/O William H. Rhodes-Moorhouse led the attack on a force of Heinkel He 111’s, escorted by Messerschmitt Bf 110’s over the Channel, off Selsey Bill. F/O Carl R. Davis shot down a Messerschmitt Bf 110, while Flt/Sgt. Arthur H. D. Pond destroyed a Heinkel He 111. Flt/Sgt. Pond then saw it collide with another Heinkel and both fell away in flames. Hurricane Mk.I, Serial No. P3681 was set alight by a bullet in its gravity tank, during an attack on some Messerschmitt Bf 110’s. The pilot, Sgt, Arthur W. Woolley baled out with broken ribs and slight burns and was taken to the Parkhurst Hospital on the Isle of Wight. His aircraft crashed at a house belonging to Mr. Manwell, Homeleigh, Solent Road, Cranmore, Isle of Wight at 6.20pm. Arthur Woolley was born on 25th August 1918 in Bristol. His family later moved to Beckenham in Kent where he attended the Beckenham Grammar School. After school, he spent a short time working as an engineer with the BBC before enlisting into the RAF on 23rd October 1937. At the outbreak of the Second World War he was serving with No.604 Squadron and was posted to No.601 Squadron at RAF Tangmere on 5th July 1940. On 26th August 1940, he was forced to bale out of Hurricane Mk. I, Serial No. V7238. The reason why is unclear. It might have been from enemy action or mechanical failure. His Hurricane crashing at the rear of Captain’s Wood, Great Totham, Essex. 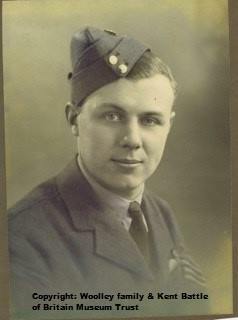 Woolley was commissioned as a Pilot Officer on 27th May 1941 and later transferred to the administrative branch. He was released from the RAF on 11th June 1948 as a Flight Lieutenant but after about a year he returned to flying and joined the RAFVR. Arthur Woolley was killed on 28th April 1955 as a test pilot for Airwork Ltd when the Sea Hawk jet he was flying from Abbotsinch Royal Naval Air Station crashed into the Clyde between Shoales Buoy and Rosneath Point off Kilereggan. He was thirty-six years old. Items excavated from the crash-sites of both the Hurricanes he baled out of during the summer of 1940 are on display within the Kent Battle of Britain Museum and form a lasting memorial to the then Sergeant Arthur W. Woolley.